When Amanda was a child, her father traveled frequently for business, always bringing her back a book as a present. Whether she was getting lost in the pages of a tale about far-away knights, girls with supernatural powers, or kindly giants, she was quickly hooked on stories. Nowadays, she writes books of her own. 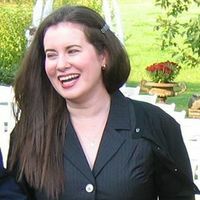 Her debut novel, North to Nara (Crimson Sash, Book 1), a YA dystopian romance, was released by Inkspell Publishing in March 2019. To ask Amanda Marin questions, please sign up. We’d love your help. Let us know what’s wrong with this preview of Glimpses of Wilderness by Lee Ann Ward. We’d love your help. Let us know what’s wrong with this preview of Within a Captain's Power by Lisa A. Olech. We’d love your help. Let us know what’s wrong with this preview of Within a Captain's Hold by Lisa A. Olech.